AS OF JANUARY 3, 2015, IT WAS DISCOVERED THAT THIS PLACE HAS CLOSED. Looks like the Mesclun brand is gaining legs and growing. 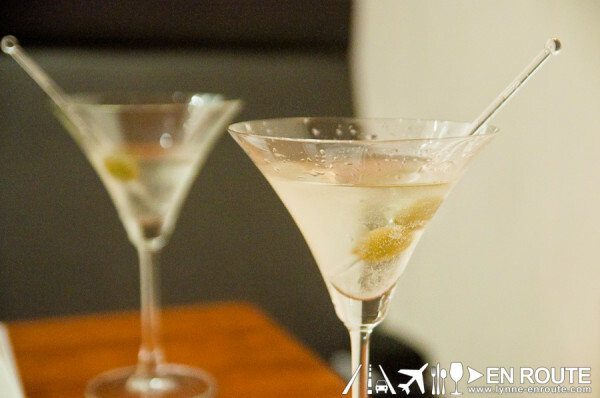 The very first Mesclun branch was actually inside the Linden Suites, established some time late of 2012. 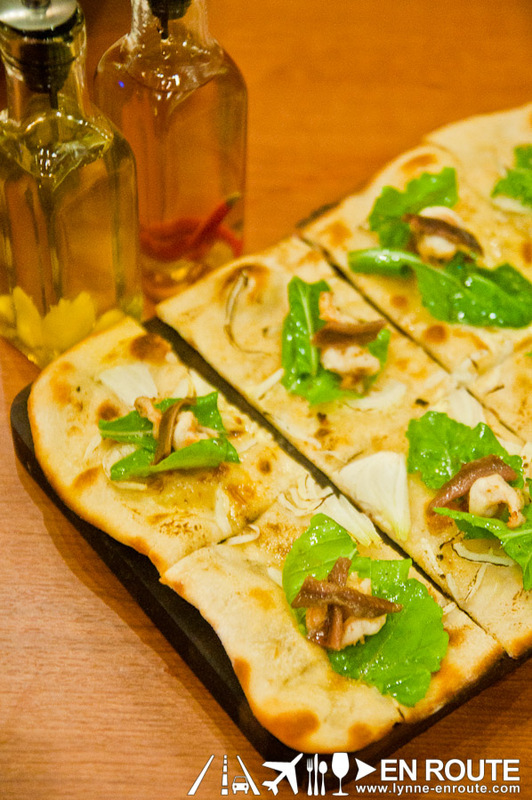 Relatively hidden, those who took the effort to get to it though are rewarded with possibly the best sisig-cream pasta in the metro, partnered with comforting flatbreads and a deliciously crispy duck confit. 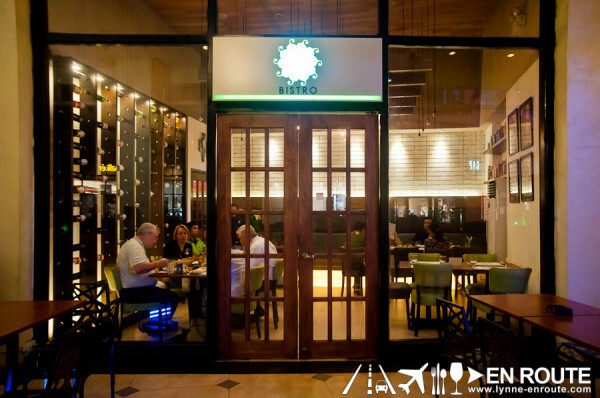 Second branch of Mesclun was launched in Serendra last 2013, tapping the Fort Bonifacio market and making a great bistro-style addition to the development. Now, they set their eyes on Eastwood in Quezon City, converting a portion of Chuck’s Deli into Mesclun Bistro (Chuck’s Deli is another creation from chef Katrina Khun Alcantara). This Mesclun incarnation is a lot homey and seats just close to 25 people (including the outside). 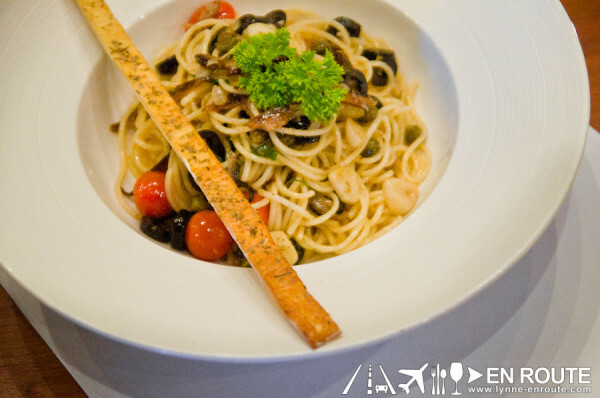 Its size is true Parisian bistro style, making it quite homey and intimate. 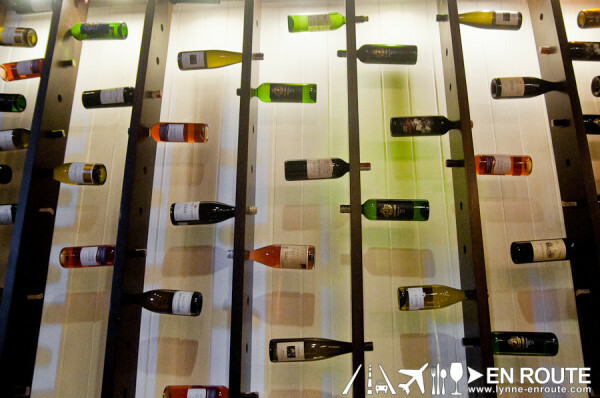 What is still constant in all the Mesclun branches, though, is that wall of hanging wines. Very unique. 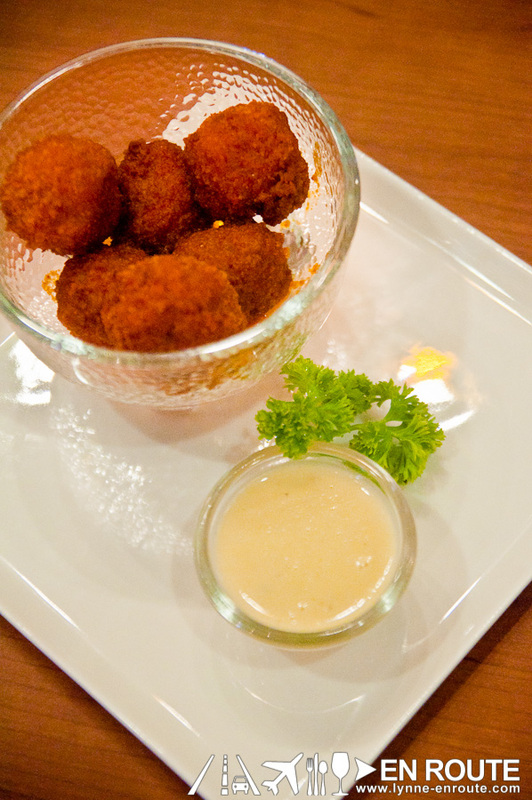 The Buffalo Balls (PHP 315.00) again make their appearance here. This recipe is based on the famous “Buffy” that people have tried to slay in Chuck’s Deli. 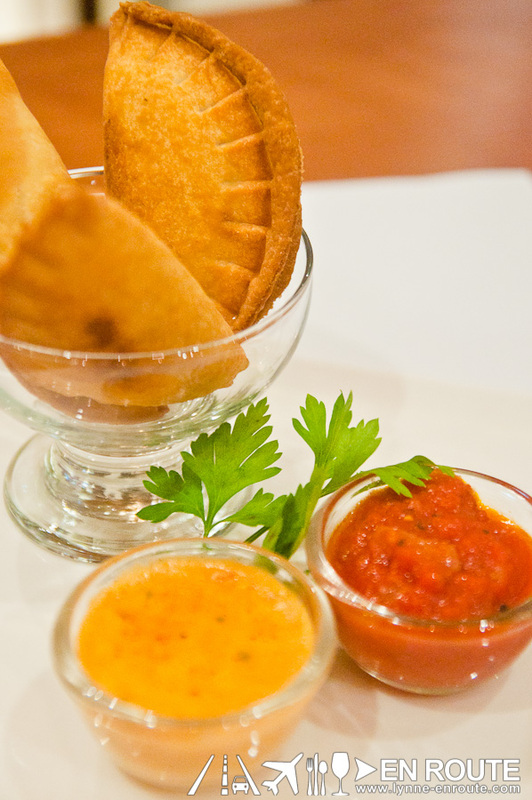 With the blue cheese dip, the spicy notes are balanced with strong, rich flavors. Two new entrants, here though, are the Mushroom Duxelle Empanadas and Andre’s Poke (PHP 345.00). Poke is a tuna ceviche style of food inspired by some of the Hawaiian flavors of sesame and seaweed, either used as a dip or eaten alone. These two are highly recommended. 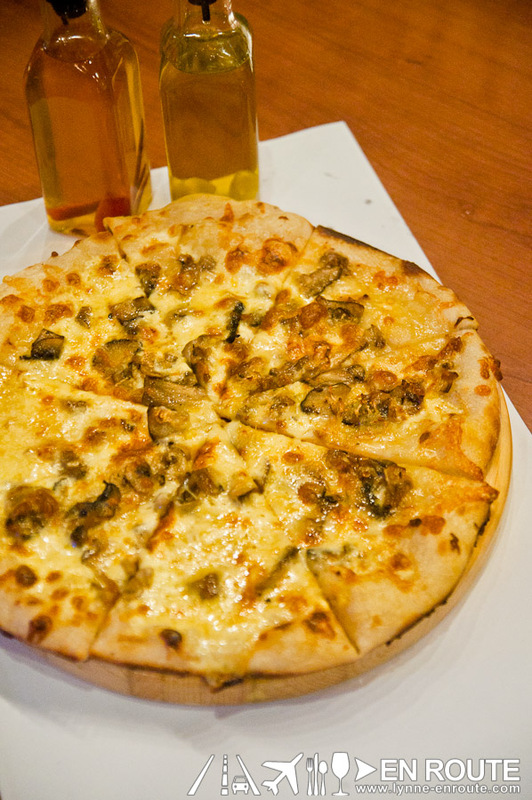 It’s flatbreads, pasta, and pizzas after your starters, like the Shrimps and Anchovies (295.00). What makes this seafood pizza easier to handle is the arugula that cuts through the strong flavors. As a light meal, this goes well with some wine. 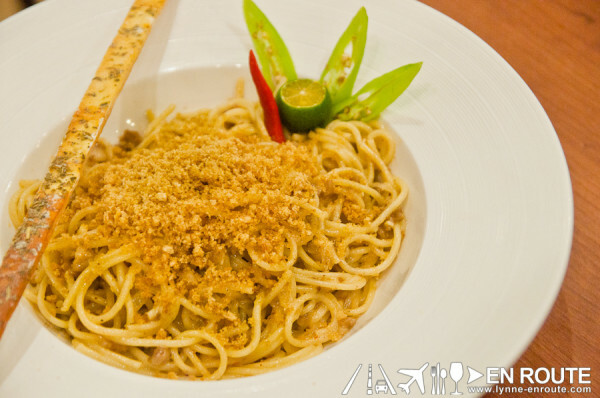 Lovers of their Sisig Spaghetti (PHP 245.00) will be happy that you can get it here at their Eastwood branch. But more than that, you should check out this new Pasta flavored with anchovies, olive oil, and then its dominating flavor is cut with a hint of kaffir lime. Adding that citrus zest creates this overall balance and doesn’t make the pasta too salty and difficult to finish. Who knew kaffir lime was good for an Italian-Filipino fusion pasta? Fantastic! Same can be said for their Clam Vodka Pasta (395.00). 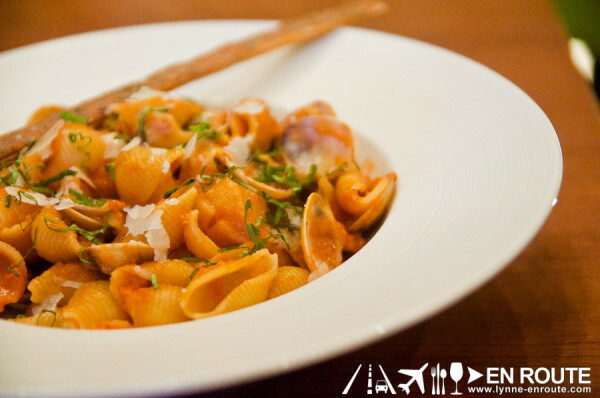 The vodka is reduced to remove the alcohol sting, leaving this faint citrus flavor in a tomato-cream sauce for clam-shaped pastas. 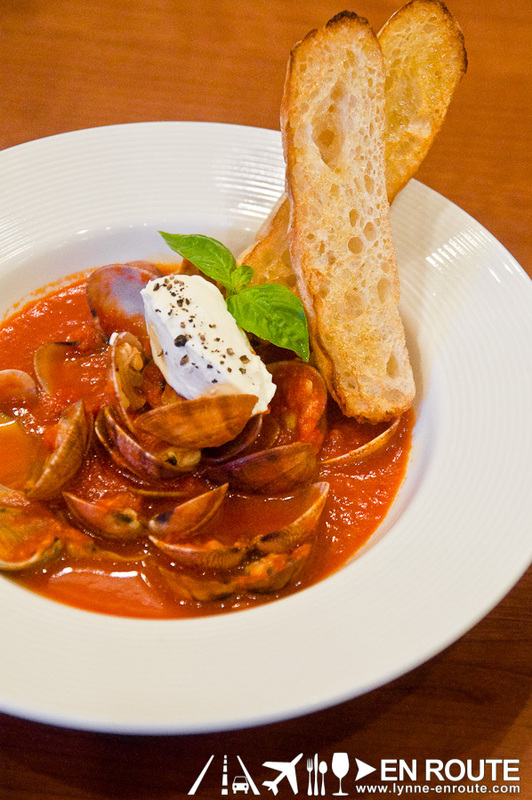 Their main dishes will blow you away. 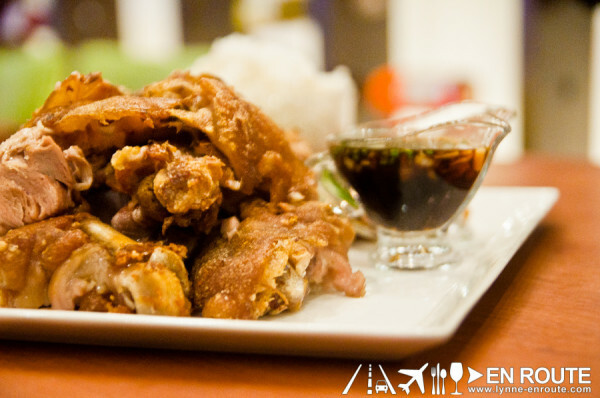 Let’s start with a crispy pata recipe deep fried in duck fat. That confit technique for duck leg is incorporated into the Filipino style crispy pig knuckles, and served with your traditional sauce. Duck fat seems to give the meat a smoother texture, making it sliding straight into your tummy ever so smoothly, as you follow it with a dollop of piping hot rice. This is what Filipino comfort food is about. 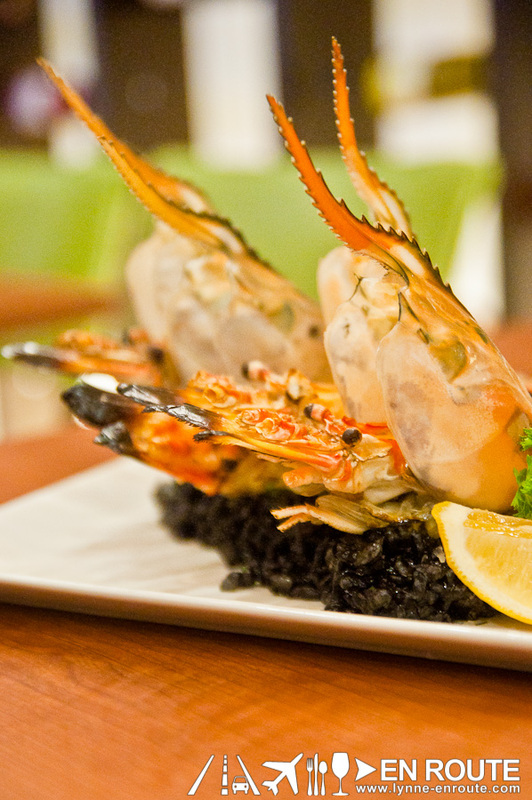 “Ulang” is basically the local version of the freshwater crayfish. It’s got everythhing you will see in a crayfish, including pinchers, albeit strangely small. The head, though is where all the flavor lies, and they have preserved it well with a fancy presentation to boot. Oh, and let us not forget that these are resting over a bed of rich squid ink risotto. Sinful. 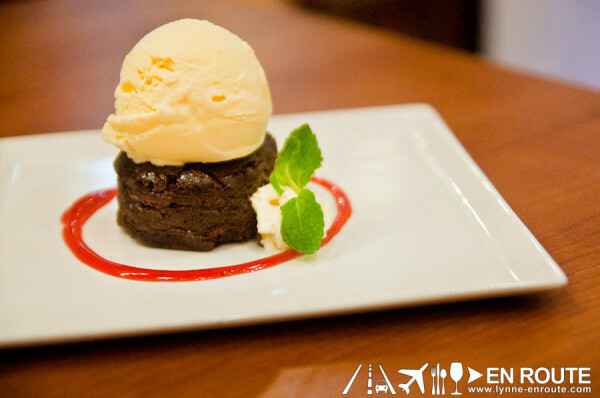 No worries about the richness cloying your palate as you can get desserts to end everything with a sweet and creamy note, from ice creams flavors of Green Tea, Fresh Strawberries, and Chocolate, to a Flourless Chocolate Cake topped with Vanilla ice cream. Really, Mesclun is a no-fail choice when dining out with friends and families, as its sharing portions of what may be the the proper and well-due addition to the Eastwood mall will get people coming into this quaint little shop over and over again. 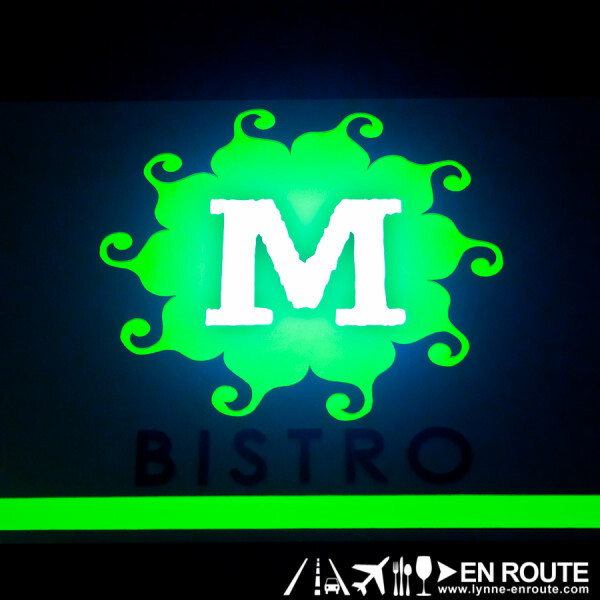 Mesclun Bistro is located at the G/F of Eastwood Mall, Eastwood, Quezon City, Philippines. We know what you mean. 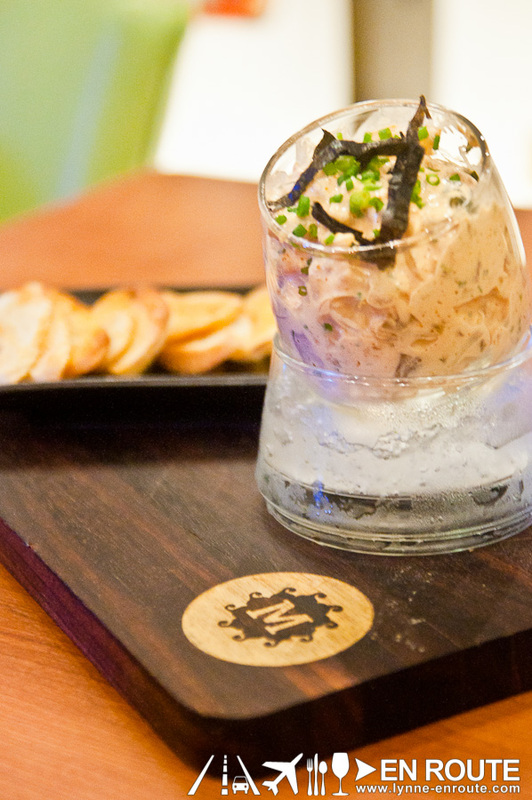 If it wasn’t for places like Mesclun, we’d have less reason to go to Eastwood too. 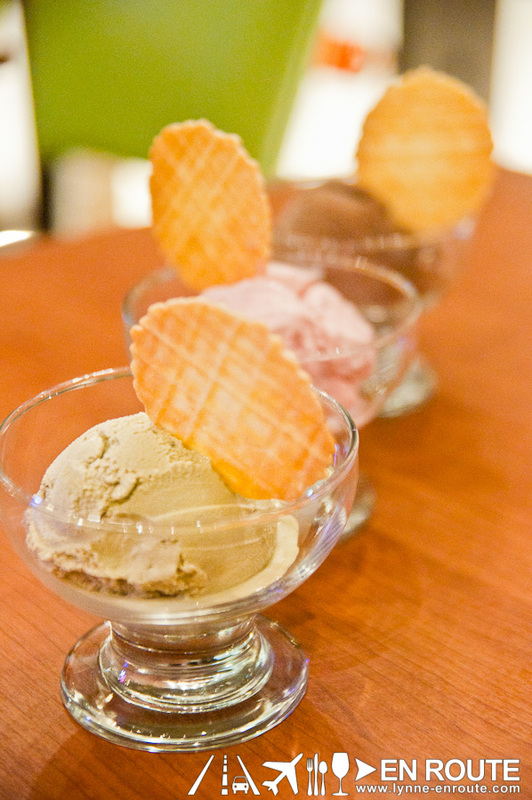 And yes, the ulang is highly recommended!